Like British Gas, Honeywell is an institution and the home heating specialist is nearly 110 years old. Still, age is no barrier because ‘Evohome’ is the most sophisticated smart thermostat on test. Its differentiator is ‘zonal’ control. This means you only heat specific zones (typically rooms) as needed. For example, bedrooms could be warm at night and heating off elsewhere or vice versa and kitchen heating off during cooking times. This works by replacing the thermostatic radiator valve (TRV) on every radiator you want to control with Evohome’s wireless alternative. Each TRV communicates with the smart thermostat, which can then be individually controlled by your web browser, phone or a colourful touchscreen controller provided. While larger homes are more likely to benefit than small flats, we found these benefits were profound. We had the Evohome during autumn, when heating is on less often, but still saw cost reductions of over 25%. The downside to all this is upfront cost. The basic system and installation weighs in at £350, plus £59 per TRV or £200 for a pack of four. Kitting out a big home could therefore easily cost £1000, although TRVs just screw in so could be added in stages. Evohome also can’t match Nest and Tado’s smart scheduling, though it does offer the same basic home/away heating on/off mode as the Hive. 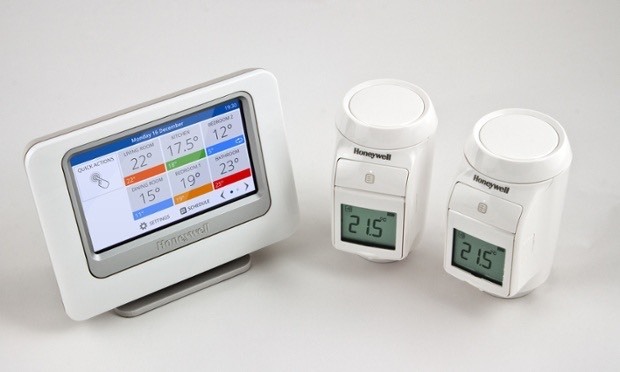 Regardless, the Honeywell Evohome remains the money-no-option king. Click on one of the smart thermostats below for more information.